The best way to end this year is to have something to share with the people you love the most; your family. We believe that this is the best moment to spend some time together and share unique experiences, treat them to a swim with dolphins in Cancun and start 2017 with a bang. There are many ways to spend time with your family: a picnic, going to the theatre, cooking together or playing games at home, and all of these are excellent choices to keep them close. However, our suggestion of this day is to do something that very few families do: swim with dolphins in Cancun. Primax 4: as it name says, this interaction is for 4 people, it lasts 45 minutes and if this weren’t enough, free transportation is included. If your child measures less than 1 meter and is younger than 8 years old, he/she should swim with an adult, if your child is taller and older and wants to swim alone, he/she will be able to do it thanks to the Dolphin Kids interaction, while you keep a close eye on him/her and witness a moment your child will never forget. If it is only your partner and yourself, you can experience an exclusive swim with dolphins in Cancun only for the two of you: 45 minutes of interaction in the water and 15 minutes of training, you will both enjoy this activity that includes free transportation. Sometimes families are bigger than we think and they share relax and holidays moments with their favorite uncles and aunts. If this is your case, you can choose between two different interactions: Interax or Splash, both have a capacity of up to 10 people and 30 minutes of actual interaction. Family is one of the most important things in one’s life which is why we believe that you should end this year in an amazing way and start 2017 with the best attitude and share a unique moment with the people you love the most. Happy New Year’s Eve! 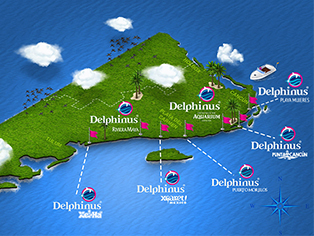 In Delphinus, our dolphins and all the team wish that all your dreams come true, and hope that 2017 will be an unforgettable year for you and all your family, enjoy your swim with dolphins in Cancun!